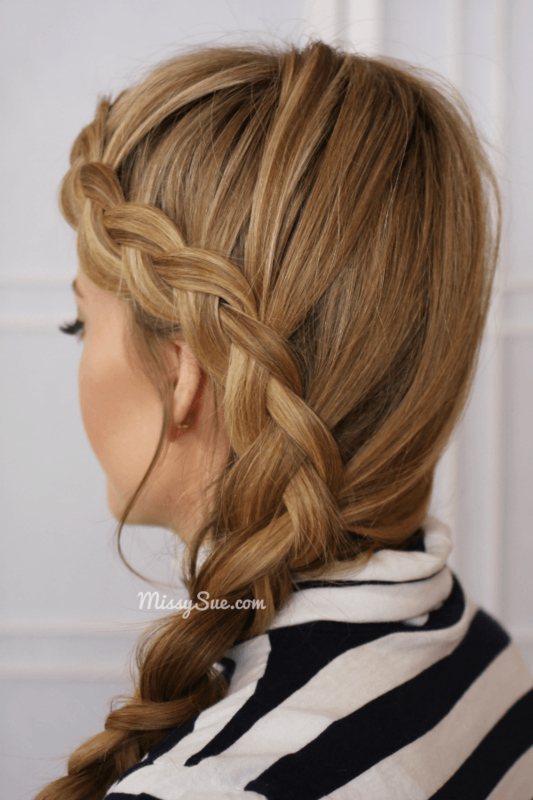 The Dutch braid is a great hairstyle to try after you have mastered the French braid and are looking for something new. The look is quite simple to achieve though it may appear tricky at first. The Dutch braid is actually an upside down French braid where the strands are simply wrapped under the middle strand instead of over the top like the traditional French Braid. This specific braid only pulls in hair from the back side of the head to give the appearance of a semi-floating braid that trails along the hairline, down behind the ear, and finishes in a soft, side braid. Watch the video for the full tutorial. Hope you enjoy it! Have a request? Let me know in the comments section! I love all your tutorials and styles! You are a great teacher and are so sweet. Thank you for your videos! Hi Missy! Can you show us what your haircut looks like with your hair down? I want to be able to do your amazing braids so I want to show my hairstylist how to cut my hair. I have lots of layers so hair is falling out of my braids. :) Thanks!! You are such a doll! I’m not the best at anything outside of the typical braid but I have got to try this. So super cute. Thanks girl! i luv ur hairstyles.specially da sidebraids.n i hope u keep amazing us wid many more chic hairstyles.